The pivot table shows various statistics for products aimed at Babys and toddlers. There's a fair bit to do to get this to work! To start with, if you haven't already done so run the script in the above folder to generate the MAM database (not for commercial use or copying). We'll create the columns shown selected in the next stage of the exercise. 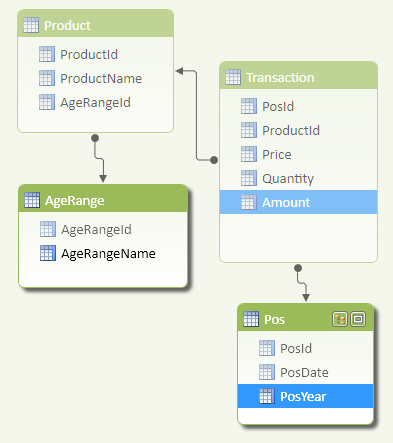 A column called PosYear in the Pos table to give the year for each transaction date. Create the measures in the order shown in the table below. Number of transactions Count the number of rows in the transactions table. Total value Sum the Amount column in the transactions table. Average value Calculate the total value / the number of transactions. You should now be able to create your pivot table, with the average value correctly calculated for each cell! When you've done this, save this workbook as Phew, then close it down.